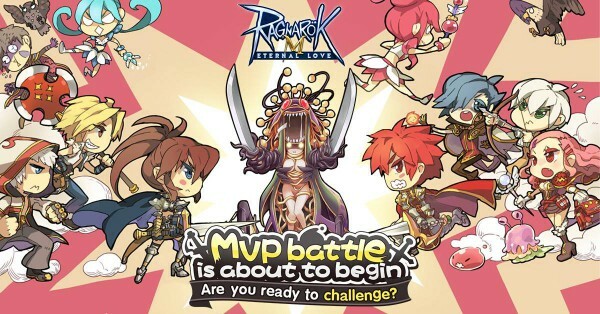 Ragnarok M: Eternal Love SEA Server MVP Battle Update! We have scheduled server maintenance on March 20th, from 12:00PM to 4:00PM (GMT+7), to process a new update patch. During the maintenance, players will not be able to log into the game. After the maintenance, we will send 2x 「Adventurer Coins」, 2x 「Hot Meal」, and 2x 「Lightning Chain」 as compensation. We apologize for this inconvenience. * After entering the instance, your party will have a 10-minute cooldown period where you cannot rematch until you slay an MVP or the instance ends. * If you leave the instance while not having left your party, you can re-enter the instance by talking with the NPC. * The amount of MVP and MINIs in the instance is based on the individual parties. * During the instance, different party members can attack each other. * The reward mechanics of MVP and MINI are the same as they are outside. * If your party has won a Boss fight, each party member will receive certain amount of “Honor Proof” and “Mithril Stone” as their rewards, depending on the boss. * The maximum reward for each event is limited at 4 MVP and 4 MINI.